Gary Presley: "I Did Not Know That!" A few days ago, I received a "well done" about my memoir from a friend of a friend who I have since friended on Facebook. 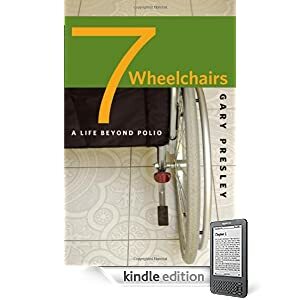 Sure enough, I looked this morning, and there it is: Seven Wheelchairs: A Life beyond Polio in Kindle. Folks at The University of Iowa Press had said a Kindle edition was being planned, but they apparently forgot to tell me it had been produced. Perhaps the incident of digital pirating last year spurred their effort. Good for you, Gary. You're officially an ebook author now too. You'll have to start promoting that too, cause you may get more sales that way.